When it comes to finding your boss or co-workers a special gift, we have you covered here at Bisket Baskets. Here at Bisket Baskets our executive gift baskets offer a wide selection of gifts for your office. If you’re a business owner, reward your employee’s hard work or a special occasion with one of our gourmet baskets. The upcoming holiday months are a great opportunity to show your colleagues how much you really appreciate them. For your Boss, take a look at the Corporate VIP Gift. This the perfect gift for your boss or supervisor to indulge in. A stylish canvas container holds an assortment of delectable products. Included in this gift set are a variety of cookies and crackers, smoked salmon, gourmet cheese and so much more! For your colleagues, go for The Gold Gift Tower! Your co-workers will love to snack on all of these delicious treats in during the work day! Six decorative boxes are stacked 20” high and filled with delicious sweets, treats, and meats. In the boxes are candies and chocolates, assorted mixed nuts, gourmet popcorn, and chocolate macadamia cookies. 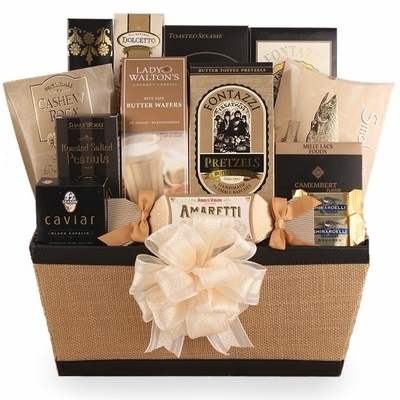 Corporate gift baskets are one of the most popular corporate gifts to send. There are so many more different executive gift baskets to choose from! Shop with us today at BisketBaskets.com.